EVs from rival automakers are on display at a UK showroom that aims to promote the technology. 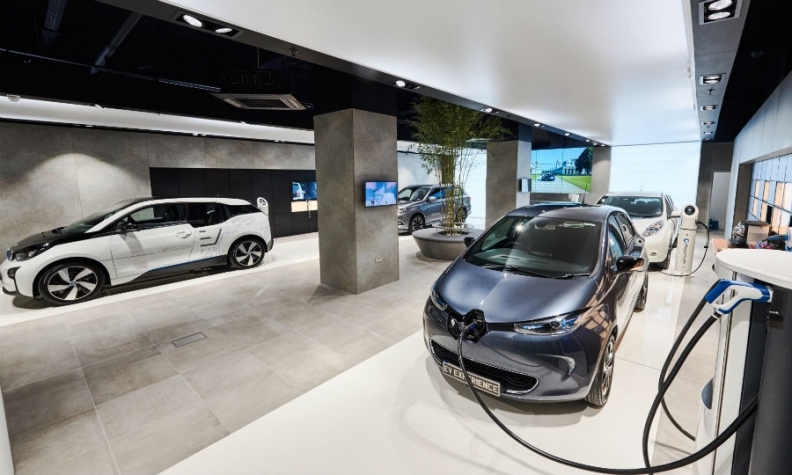 LONDON -- Automakers have set aside marketplace rivalries to open a multi-brand electric car showroom where staff don’t sell vehicles but instead explain EV technology to visitors. The showroom has a marketing function rather than a sales function, said Nissan UK's Ed Jones, the automaker's EVs' category manager. Staff will give out prices and pass on serious inquiries to local dealers, but that's not their primary job. The goal is to ensure visitors leave the showroom more open to buying an EV, Jones said. Nissan isn't worried about losing sales to rivals whose cars are also on display because it is "confident" of its position in the marketplace, he said. BMW's UK product manager for E-mobility, Dan Elliot, said more EVs are appearing on the roads and people have now more questions about the technology. "Here they can be answered," he said. The showroom is also a good way to convert that people's interest in EVs into a possible purchase, Elliot said. Chargemaster CEO David Martell said the showroom is a pilot and its multibrand format could be repeated elsewhere if it works. The store is in a busy shopping mall and has space for four EVs and rotates them regularly. A fleet of 59 models located nearby is available for test drives. The idea is promote the cars away from the dealership environment where sales staff more used to selling internal combustion cars have been slower to embrace electric technology. "The shopping center environment means it’s more relaxed," a Mitsubishi spokesperson said. "It's less of a brand experience and more of a place to experience the technology." The venture is part-funded by the UK government, which paid for the test cars, and is part of a wider push by Milton Keynes, which has about 230,000 residents, to lift EV sales to 23 percent of total car sales in the area by 2022. The figure is currently at 1 percent. Enticements to EV owners include free parking and use of the bus lanes. The UK is pushing electric cars nationally and in July said it would ban sales of non-electrified vehicles after 2040. The Milton Keynes store's shopping mall location is part of a wider trend to promote cars to people shopping for other products, rather than relying on them visiting out-of-town dealerships. A pioneer was Hyundai, whose outlet in the Bluewater shopping mall southeast of London became one of the brand's top 10 dealers in the UK within 12 months of opening in 2015. Tesla also has a store in a mall near the center of London. A multi-brand store devoted to just electric and plug-in hybrid vehicles is new to the UK and Europe, but it mirrors one that opened in May in the United States in Portland, Oregon. This store is called Go Forth and local people can view and test cars such as the Chevrolet Bolt, Ford C-Max Energi and Nissan Leaf. It also doesn't sell cars but spreads the EV message as part of a wider government-funded initiative to increase sales. Similar showrooms exist in Shanghai, China, belonging to an EV specialist EVBuy. They have multiple brands and they also sell cars.